Hooray! 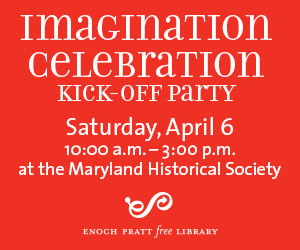 We’re so excited about Imagination Celebration returning to Enoch Pratt Free Library this April. Join us throughout the month for kid-friendly arts and crafts, events, and more. Our inspiration this year is the book The Day You Begin by Jacqueline Woodson. With bright, beautiful illustrations and lyrical text it’s sure to be a great selection for story time. The book is about how our unique stories helps us to find understanding and common ground. We’re starting off the fun with the Imagination Celebration Kick-Off Party! Join us Saturday, April 6 at 10am to 3pm at the Maryland Historical Society in Baltimore. Stop by for crafts, movement, and games with our community partners, early learning activities for children ages birth to five, free face painting, and souvenir photos to take home. For a full list of Imagination Celebration events visit here.